projects are delivered on budget and on schedule. Our quality procedures focus on Early Planning and continuous communication with our Customers, as a means to ensure projects are delivered on budget and on schedule, minimizing deployment and ongoing maintenance costs. Our quality procedures are inspired by Good Automated Manufacturing Practice (GAMP), a set of guidelines for manufacturers and users of automated systems in the pharmaceutical industry. Even though we do not cater the pharmaceutical industry nor do we apply GAMP to our projects in a strict sense, GAMP does provide an outstanding framework to our quality procedures. GAMP describes a set of principles and procedures that help ensure products have the required quality. One of the core principles of GAMP is that quality testing must be built into each stage of the manufacturing process. In other words, the quality of the final product (i.e. Beer) will depend on the quality of all the components used to manufacture that product. As it applies to us: the quality of the Process Control System (hardware and software). The following text outlines the general procedure that BrauXp follows to achieve these objectives, which does not replace but rather gives an informative overview of our more detailed Service Works Terms and Conditions. Our projects start with a telephone and/or email conversation about the intended project. We will then work up a design concept accompanied by a description of the project’s execution phases, and present them to you as a written proposal for further analysis. The proposal will state our scope of work, our deliverables, how much it will cost, and when it will be ready. Professional Documentation is a key component to GAMP, and a tool that ensures the Process Control System is constructed to meet the Customer’s specifications. Once the project has been awarded, the initial purchase order has been made, and applicable initial requirements have been met, we will create a Project Specification document (aka. Project Plan) which includes a description of the scope of work and a Project Schedule. This Project Specification, together with a Functional Design Specification (FDS) will then be used to drive the project’s implementation phase. The FDS is a subset of the overall scope of work that defines the software’s intended functionality, and is the document used later to drive the Factory Acceptance Test (FAT). BrauXp will then proceed with the implementation of those items specified in the FDS. Depending on the project’s scope, additional Software Design Specifications (SDS) may also be generated which describe the inner workings of the software in technical detail. When construction is complete, deliverables will be thoroughly tested internally until we are satisfied. Only then will we proceed to present the results to the Customer in a process called the Factory Acceptance Test (FAT). The FAT is comprised of a series of tests, driven by BrauXp and witnessed by the Customer, where the deliverables are presented to the Customer and verified against the Functional Design Specification for approval before delivery to the Customer’s facility. Tests are typically carried out at BrauXp’s facilities with the Customer witnessing the process remotely via Remote Desktop and Online Meetings. When delivering custom software, this will typically involve the presentation of the software in a simulated environment. Our unique Virtual Commissioning procedure involves testing the complete software’s functionality as it would perform once installed at its final location. It allows the Customer to experience and interact with the software, and issue any comments on features that may have been missed during the analysis and design phases. It also allows BrauXp to do any corrections before the final product is shipped out to site. The implementation phase is officially completed after the FAT has concluded and the Customer has accepted the deliverables. Deliverables will then be shipped to site for further deployment. The deployment or commissioning phase involves the on-site testing, startup and optimization of the deliverables. This involves multiple steps until the software is finally handed over to the customer. On-site installation and configuration of the software on the final Process Control System’s hardware to be utilized. Dry-Test: testing of devices and instruments connected to the system, such as valves, motors, temperature transmitters, flow transmitters, level sensors, etc. Wet-Test: testing of equipments, such as temperature, flow and level controllers, utilizing water as a primary medium to adjust the operating parameters of such controllers. Startup: initial start and ramping-up of production. Basic Optimization: adjustment of equipment parameters and recipes for basic production. Site Acceptance Test (SAT): a series of tests driven by the Customer and supported by BrauXp, where the deliverables are verified for final approval. The deployment phase is officially completed after the SAT has concluded and the Customer has accepted the final deliverables. This is when the system is officially handed over to the team that will not only operate, but also maintain the system in the future. As the deployment phase is concluded, the Customer takes final ownership of the deliverables, i.e. the Process Control System. The maintenance phase is a continuation of the optimizations started during the deployment’s phase, where the Customer’s maintenance team carries out ongoing process improvements as day-to-day operations demand. This would typically involve re-configuring recipes, adjusting parameters, or making changes to the existing process control software. Why Early Planning is important. We already mentioned the importance of Early Planning as a means to ensure product quality, by applying the guiding principles of Good Automated Manufacturing Practice (GAMP). It also is the best method to ensure that projects are delivered on budget and on schedule to the Customer’s satisfaction. But there is also another reason to use Early Planning, which is to minimize ongoing maintenance costs once the project has been delivered. By using Early Planning, Total Ownership Costs (TOC) are also reduced, as can be seen in the following images. 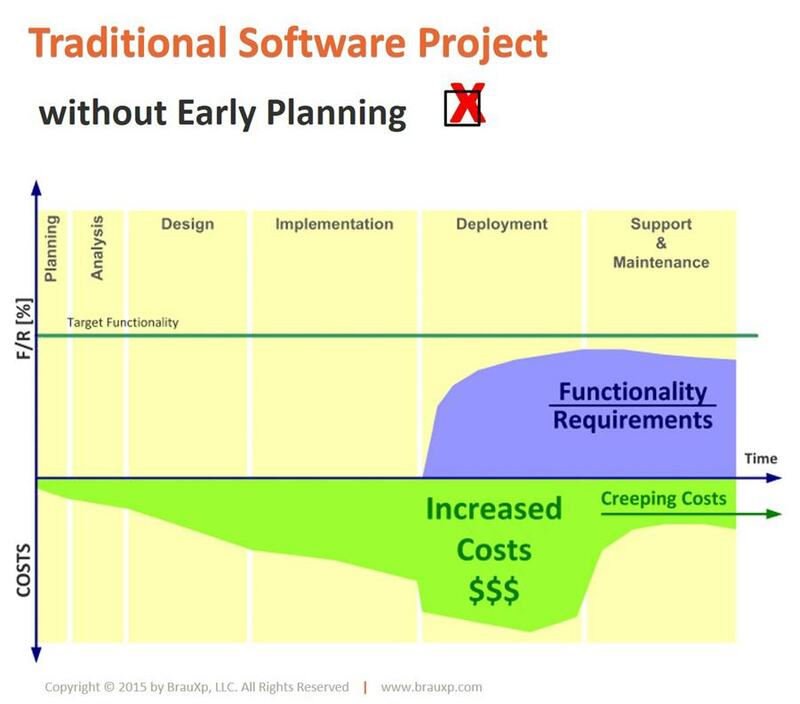 The following image shows how the lack of Early Planning would lead to increased deployment costs, and creeping maintenance and support costs after the project has been delivered. 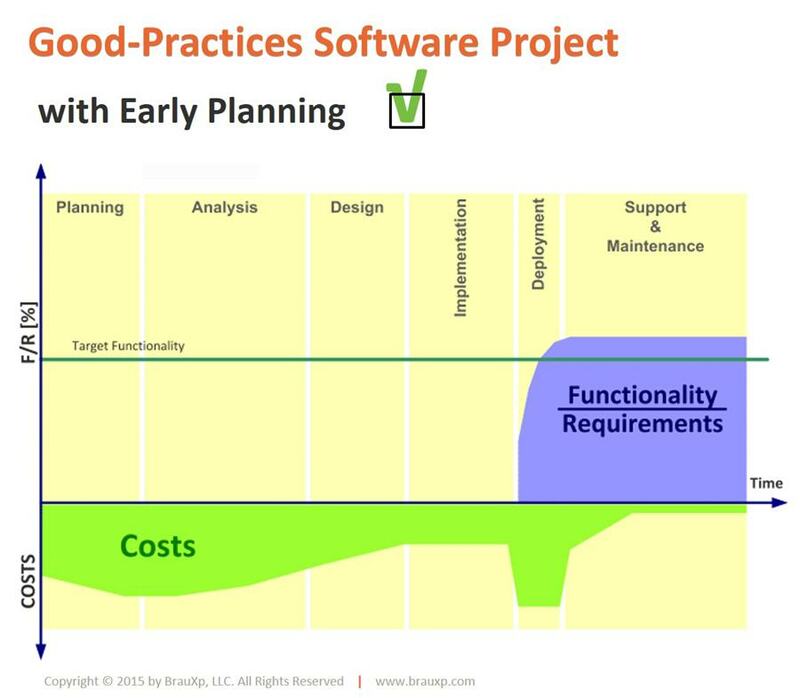 In addition, there is a higher risk of not achieving the sought functionality, due to budget limitations. On the other hand, by using Early Planning as a guiding principle throughout the project, one is able to achieve shorter deployment phases and minimize maintenance and support costs after the project has been delivered. The following image also shows how the sought-for functionality can be achieved due to smart investments in the previous planning, analysis and design phases. See how we can provide these benefits to any automation project.